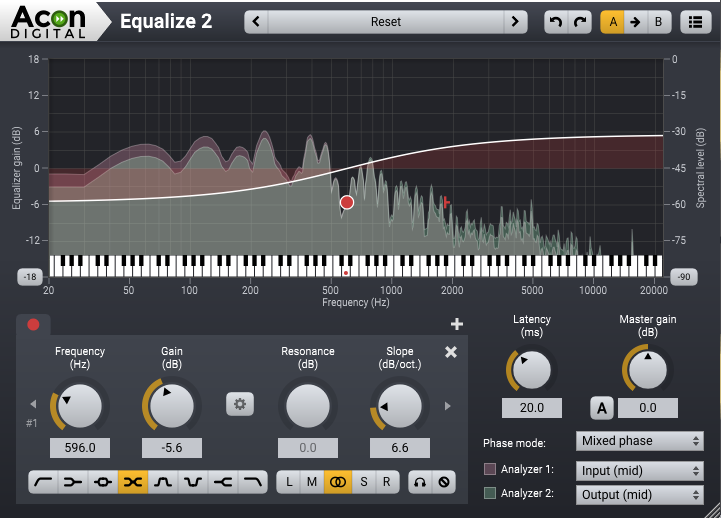 Acon Digital Equalize 2 is available for both Windows (PC) and OS X (Macintosh). Both 32 and 64 bit versions are available, and the plug-in formats VST, VST3, AAX and Audio Units (OS X only) are supported. The upgrade to version 2 is free for all Equalize customers and the license key is valid in version 2. Absolutely brilliant EQ! Use it everyday. Clean equalizers such as Acon Digital Equalize are fully characterized by the filter curve and the phase distribution. When you use the linear or minimum phase modes, Equalize won’t sound different than any other properly programmed equalizer capable of producing the same filter curve. However, the phase distribution has a huge impact on the audio quality and the mixed phase mode is unique in Equalize. The following audio examples illustrate the effect of the different modes. The equalizer settings were kept identical except for the phase mode in the processed versions of each demo track. The Acon Digital Equalize 2 user interface with the new tilt filter in action. 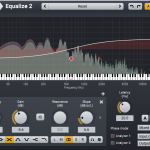 The new version of Equalize includes two new filter types – tilt and bandpass. It now offers a total of eight different filter types. Just like the previously available filters, both the tilt and bandpass filters offer the unique continuously adjustable filter slopes in the range 3 to 120 dB per octave. The frequency range of the equalizer curve can now be altered conveniently by dragging the edges of the frequency axis or moved by clicking and dragging the center. This makes it possible to zoom in on specific frequency ranges for more precise control. A new preferences page offer user settings such as analyzer resolution and user interface language. Another new feature is the optional piano keyboard display above the frequency axis. Band frequencies can easily be set to match a tone’s frequency by clicking the key on the piano keyboard.